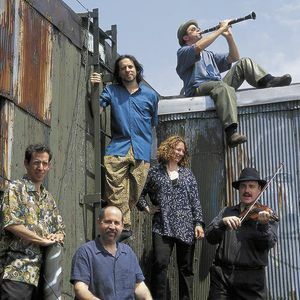 The Klezmatics are a Grammy Award winning American neo-klezmer music group based in New York City, who have achieved fame singing in several languages, most notably mixing older Yiddish tunes with other types of more contemporary music of differing origins. Current members include composers Matt Darriau, wind instruments, and Frank London, on trumpet, Paul Morrissett playing bass and tsimbl cimbalom, vocalist Lorin Sklamberg on accordion, and Lisa Gutkin on violin. Past members include David Licht on drums, Alicia Svigals on violin, David Krakauer, Margot Leverett, and Kurt Bjorling on the clarinet. Frequent guests with the band have included Boo Reiners, Susan McKeown, and drummers Richie Barshay and Aaron Alexander. The group formed in New York's East Village in 1986. They have appeared numerous times on television, including on the PBS Great Performances series, with Itzhak Perlman. Their lyrics are sung in English and Yiddish. They also recorded pieces in Aramaic and Bavarian on Schneider-Zwiefacher and on Shvaign = toyt. The Klezmatics appeared live, in June 2003, in collaboration with the Jenaer Philharmonie of Jena, Germany. They have also participated in cross-cultural collaborations, most notably with the Palestinian musician Simon Shaheen. Their most recent album, Wonder Wheel, melds The Klezmatics' unique take on klezmer with the English lyrics of American folk icon Woody Guthrie. The album won a Grammy in the category of Best Contemporary World Music Album at the 49th Annual Grammy Awards. Another album of Guthrie material, entitled Woody Guthrie's Happy Joyous Hanukkahaudio, was released via JMG in August 2006. Guthrie's granddaughter, Sarah Lee Guthrie has guested with them. The Klezmatics' 20th anniversary concert took place at New York City's Town Hall on March 5, 2006. They have released CDs on the Rounder, Piranha, Xenophile, Flying Fish, Klezmatics, and Jewish music group labels. Additionally, a few members of the group appeared on the klezmer-inspired track "Stephen's Last Night in Town" from the Ben Folds Five album Whatever and Ever Amen.